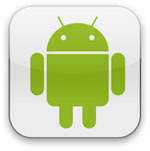 Growing demand for Android based phones shows that Google’s operating system is here to stay. The ProTexting.com team has created a version of our popular iPhone app available to the android users as well. 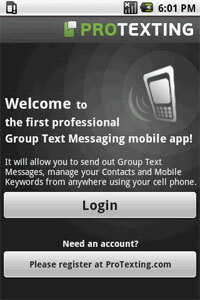 Android users can now take their Group Text Messaging account mobile. The app is designed to work as a “Remote Control” for the core functionalities of our online service, ProTexting.com. It will allow you to send out Group Text Messages, manage your Contacts and Mobile Keywords from anywhere using your cell phone. We are professionals who have been in the text messaging business for six years now. Throughout our experience one question repeats with almost every client; I want to start using text message marketing, but how can I do it without the large upfront expense and complex set up? We decided to make it affordable and easy for small and medium sized businesses and solve this challenge for them. ProTexting.com helps you communicate with your contacts more efficiently. The cell phone has become a permanent companion in our daily lives. 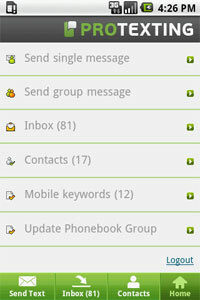 This is why text messaging is the best way at the moment to reach groups of people with the same message instantly. Text message is personal and is pretty much guaranteed that it will be read by the recipient. Why would you use ProTexting.com? Emphasis on great customer support – We are real people who like to talk to our clients. Call us, Email us, or Chat with us online. We make sure we answer your questions as soon as they arrive. Our team believes that our clients deserve the best service out there. We not only answer questions but give guidelines for better campaigns and share knowledge about the industry to make you achieve better results. User-friendly interface – ProTexting.com is loaded with useful features but maintains the ease of use. We have built our system with the user in mind by collecting and implementing vital user’s feedback. Guaranteed Security of your data – Our technical team goes through numerous procedures to keep your data safe. We utilize technology of physical and electronic data security to ensure every piece of information is safely stored. All of our servers are backed up nightly. Affordability – We do not sacrifice quality for low cost. However we do believe that bulk text messaging should be available to everyone who needs it. We are the most affordable group text messaging platform on the market. We Listen to Feedback – Our team believes that listening to our clients is the only way to deliver real useful solution. Most of the features in ProTexting.com has been requested by clients through the years. We continue to listen and evaluate very carefully every suggestion that comes to us. No Contracts – There are no long term commitments. Upgrade, Downgrade or Cancel at any time. Message and Data Rates May Apply. Max 4msg/wk. For Help, send HELP to 63566. To unsubscribe from any ProTexting.com list, send STOP to 63566 or contact our support team here or call 1-800-258-9115. © 2019 ProTexting.com. All rights reserved.